Like with any field of learning, lecture is necessary. We try to minimise text content and when we can't do otherwise, we ensure that the description is concise, precise and accurate. Below is a sample of the lecture content you might expect in our courses. They had one link in common: their love for the ART OF PERFUMERY. Carles was known for his ability to create fine perfumes using simple formulae and economical ingredients. ''Perfumery is an Art, not a science, as many seem to believe - A scientific background is not necessary for the perfumer; scientific knowledge may even sometimes prove an obstacle to the freedom required in perfume creation. His fragrances were affordable, which gave Roure, the fragrance company he worked for, a marketing advantage and the ability to make a nice markup while at the same time offering affordable fragrances to their designer clients. Jean Carles was famous for developing perfume bases that could be used, as if they were single ingredients, to create new fragrances. Carles's contribution helped speed development time for new fragrances at Roure, giving them a distinct advantage over the competition. Among his master creations, we can mention Ma Griffe by Carven. 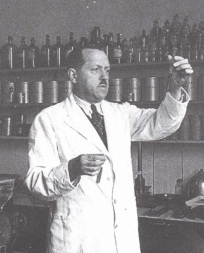 Carles was responsible for launching Roure's perfumery school (which then became Givaudan-Roure) which was famous for the perfumers who passed through it and for the perfumery training methods Jean Carles developed for Roure. Amongh those perfumers, we can name Germaine Cellier (creator of Bandit by Robert Piquet) and Jacques Polge (perfumer of Chanel House and creator of Coco). Jean Carles preferred students who did not have a background in chemistry. It is worth noting that a Roure perfumer who had gained a degree in chemistry before working for Roure, Germaine Cellier, was not on Jean Carles's list of favorites — to the point where Cellier was set up in a laboratory of her own — away from Jean Carles. Famous creator of Diorissimo and Eau Sauvage, among others. ''Perfumers are chemists no more than is the painter who manipulates chemical colors. In itself, composing a perfume has nothing to do with chemistry. The Compositeur must not let himself be influenced by systematic thoughts. Only by considering each odour by itself and in its rapport with the other odours, without any preconceived idea, will he make the best use of it"
Roudnistska wrote a book with the simple title ''Le Parfum'' in which he explains his aesthetic approach to perfumery. He is remembered as the Defender and Master of the Art of Perfumery. His philosophy is still being applied today by his son, Michel Roudnitska, who combines the Olfactory Art with the Visual Art.